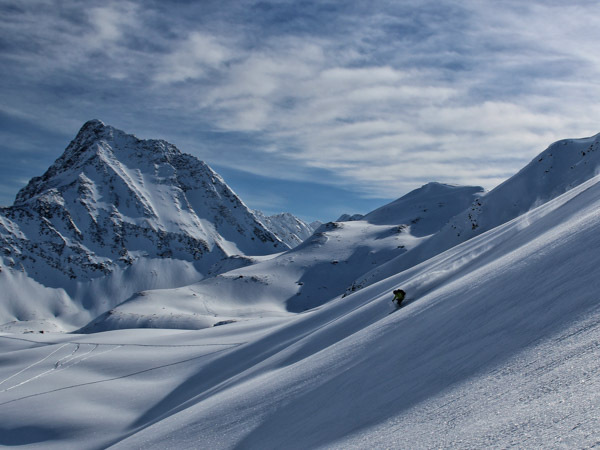 When skiing on hard-pack or groomed snow you’d usually use your downhill ski to start the turn, but if you try that in powder you’ll just end up driving one ski down into the snow like an anchor. Instead, you need a body position that lowers resistance and increases floatation so you keep moving and don’t get stuck. Weight both ski evenly, keep a centred (but agile) stance and keep your shoulders over your toes. Spreading your body weight evenly across both skis will help you keep your tips above the snow. Edges are useless in deep snow because there’s nothing for them to grip on. To change direction without increasing resistance on your downhill ski, you have to switch techniques and focus on steering with your body weight instead. You do this by weighting and unweighting as you would in moguls. In the apex of the turn bend at the knees and weight the skis as if you’re trying to push the snow away underneath you. Then when you’re ready to finish the turn and start the next one, extend your legs to unweight the skis making it easier for your body and skis to change direction. 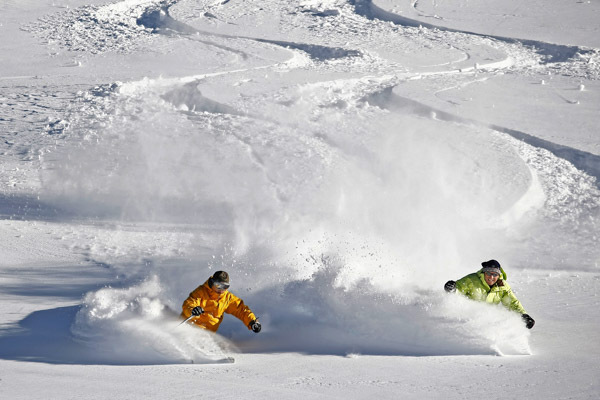 In powder, speed is your friend. When your skis are on the top of the snow you glide along with little to no resistance, but when your skis are under the snow your tips will start to nosedive (as we’ve all experienced) grinding you to a halt. Think of your skis like an aeroplane… you need speed to generate lift. On a powder day, on a piece of terrain that you’re comfortable with, practice turning your skis down the slope into the fall line to pick up speed. When you want to slow down start making a turn across the slope. Repeat this while each time increasing your time spent in the fall line. It’s important to remember that speed is a relative term. What seems fast to you might not be fast to someone else, but the most important part of learning to be comfortable at speed is to always be in control. When practising, it’s very important to maintain the correct body position outlined in skill 1. Now you’re feeling better about skiing with a little more speed it’s time to link everything together. You’re going to go from fast fall line skiing with slow turns, to elongated, smooth, flowing turns that maintain the same speed throughout. This is best practised on wide open runs or in bowls where you have a long run ahead. Make sure you have even weight on both skis, a centred stance with your shoulders over your toes. Start by completing whatever size turn you feel comfortable with, as you weight and unweight through the turn as described in skill 2. Once you feel comfortable, start allowing the radius of your turn to get longer and combine that with a shorter transition between turns. Shorter transitions between turns will keep your skis facing down the slope longer and help you keep momentum, rather than skiing across the slope which will ultimately slow you down. 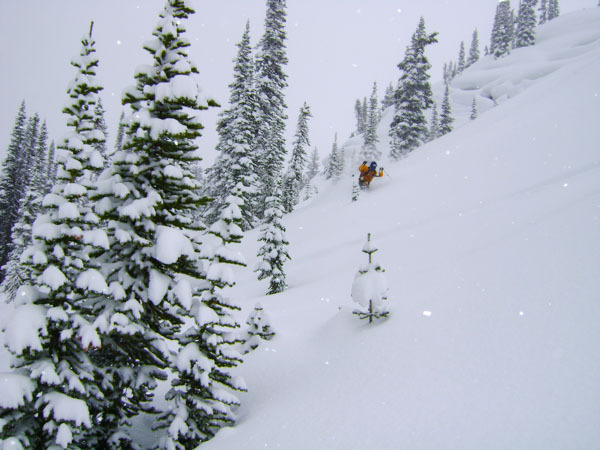 If you still have questions about skiing powder or you have some great powder skiing tips of your own, please share them with us and our followers on Twitter, Facebook or Instagram. If, after all this, you still don’t feel like you’re floating, it might be time to look at your skis. What width underfoot are they? Are they too short? Too long? 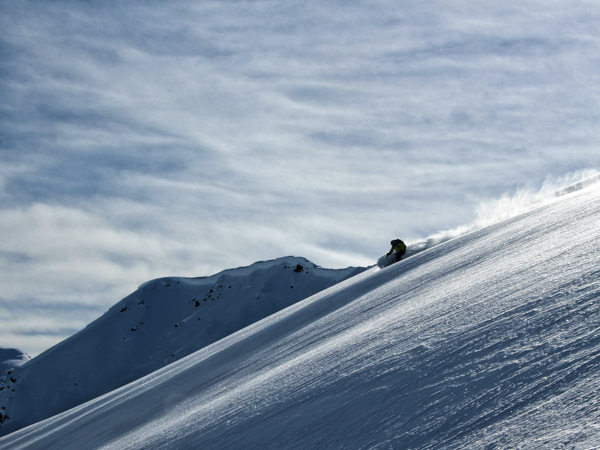 Skiing powder isn’t just about technique, having a ski that creates a large surface area but is also easy to move around is a sure-fire way to improve your powder skiing. In 1988 Atomic tasked one of its engineers, Rupert Huber, to come up with a better powder ski. So, Huber sawed a snowboard in half, turned its steel edges inward, attached ski bindings and the fat ski was born. After few rounds of refinement the first powder ski was born, the Atomic Powder Magic (or Fat Boy as they lovingly became known). You might also say that he created the first splitboard. At 115 millimetres underfoot the Fat Boys were the first super-wide powder ski of their kind and they revolutionised skiing forever. “They made it easier to ski fluffy powder snow because they had so much more surface area underfoot. They were also much shorter than the lengths people were skiing on in that day, making them easier to manoeuvre.” – said Jake Strassburger, alpine commercial manager for Atomic.